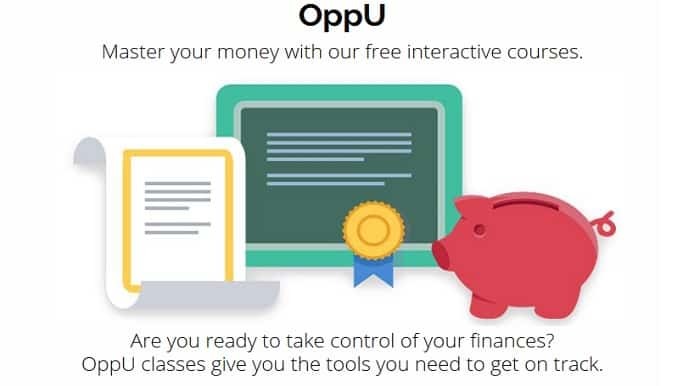 OppLoans is the online name of Opportunity Financial, a personal loans company specializing in opportunity loans for borrowers with bad credit or no credit at all. Founded in 2009, the company has made more than 100,000 loans already. OppLoans isn’t a peer lender like most of the platforms I’ve reviewed so I didn’t know much about it. A reader emailed me after they saw it advertised and asked if I had an opinion on the opportunity loan provider. Like most specialty loan companies, there’s things I like about OppLoans and a few things I don’t like. OppLoans is an excellent alternative to payday loans with interest rates less than half that which you’d pay for a cash advance. You get your loan in a day and there’s no credit check. The downside is that rates are higher compared to the peer lending sites we’ve reviewed. If you need an opportunity loan and have very bad credit, then OppLoans is likely your best solution. I put together this OppLoans review to help you understand how the company works and how to get the best rate on your loan. OppLoans is an online lender specializing in opportunity loans. They’re called that because they give people the opportunity when no one else will help them with a loan. We’re talking about borrowers with bad credit history, defaults and even bankruptcies. Most peer lending sites are not going to approve a loan if you have a 520 FICO or lower. In the past, your only hope was in a payday loan or a cash advance. Fees that amount to 500% annual interest means that’s no hope at all and it’s easy to get trapped in a debt cycle, borrowing a new payday loan every two weeks. OppLoans requires no credit check so it doesn’t base its loans on a credit score. The online application takes less than five minutes and you get an instant decision. Your loan is deposited in your checking account the next day. Opportunity loans are for $1,000 to $10,000 and can be repaid from six months up to 36 months. OppLoans operates in Alabama, California, Georgia, Idaho, Illinois, Kansas, Maryland, Mississippi, Missouri, New Mexico, Ohio, South Carolina, Tennessee, Texas, Utah, Virginia and Wisconsin. Some states restrict lending to a line of credit that works like a credit card. The opportunity loan credit line charges an interest rate and an origination fee with a 4% monthly payment on your balance. States where OppLoans offers a credit line are Kansas, Maryland, Tennessee and Virginia. Elsewhere, OppLoans offers traditional personal loans with a fixed interest rate. No collateral needed. I hadn’t heard of OppLoans until a reader brought it to my attention. It’s different from the peer lenders I usually follow. First, opportunity loans are shorter-term than most peer loans. Opportunity loans are usually paid off between six to 36 months whereas peer loans can be paid off over 60 months and more sometimes. That’s not necessarily good or bad. Most peer loan borrowers select a 36-month payoff even given the longer payoff option. What’s more important is that with either opportunity loans or peer loans, you have longer than the two weeks you get with payday loans. Having just two weeks to come up with the money means most payday or cash advance borrowers are stuck getting another loan and paying another huge fee. That makes opportunity loans a much better option because you get the time to get back on your feet and pay the loan off. OppLoans doesn’t pull your credit score, one of the very few non-payday lenders that does no credit check loans. That means loans won’t affect your credit score and anybody can be approved. Rates on opportunity loans are higher but still much lower than payday loans or cash advances. Annual rates typically range from 36% to 160% depending on the size of your loan and how long you want to pay it off. Opportunity loans are typically smaller than peer loans. OppLoans offers loans from $1,000 to $10,000 whereas most peer lenders offer up to $36,000 for loans. One feature on Opploans I haven’t seen on other opportunity loans sites is the ability to talk to a loan advocate if you have any questions. These representatives are there to support borrowers with questions on managing debt as well as loans. 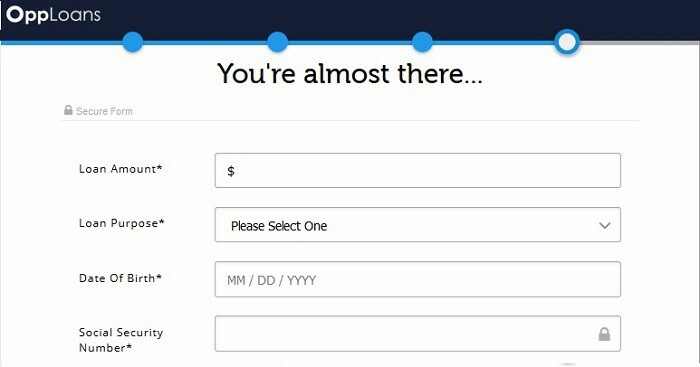 If you’d rather not call up a loan advocate, Opploans has an entire part of its website with content on understanding credit scores and debt. There’s even a program to earn credits towards your payments from the online loan education and a scholarship program. It took me less than five minutes to fill out the loan application on OppLoans. There are just four steps which could actually be just one screen. The application process is so quick because there’s no credit check. All you need is a current job and a checking account. The third step is entering your employment information including monthly income and how often you get paid. The last step is to link your checking account to get your loan deposited. Your opportunity loan and rate is based on how much you make and how long you want to pay off the loan. It’s an instant application process, faster than I’ve seen with any peer lender. Loans are deposited in your checking account the next day with payments starting the next month. Before you agree to the loan, OppLoans will tell you the interest rate and the monthly payment amount. If you live in one of the states where only a line of credit is available, you can start making withdrawals on your account the next day. You’ll have a minimum monthly payment but the actual payment will depend on how much of the credit you have borrowed against. For any type of opportunity loan, you’ll be able to log into the website and check loan balance or payment information in My Account. Your payment will stay the same each month on an installment loan but will vary for a line of credit. Opportunity loans are unsecured personal loans so you won’t need to put up collateral like your home or car but there are still a few requirements on Opploans. There’s no credit score minimum for Opploans but they will run a soft check on your credit and the loan will go on your credit report if you agree to the terms. What Can You Do with an Opportunity Loan? Opportunity loans are just like personal loans in that you can do anything you like with the money. The most common use I’ve seen for opportunity loans is debt consolidation and short-term needs. One borrower on the website says he used the loan to pay for his daughter’s pre-school tuition. Another borrower told me they paid for their dream wedding and another used the money for medical expenses. Because of the higher interest rate, you should borrow only as much as you need. Prioritize paying off the loan as quickly as possible, making extra payments if you are able. There’s no early payoff fee on opportunity loans so the faster you can pay it off, the more interest you will save. Because of the flexibility of opportunity loans, I’ve seen them used for just about anything including wedding loans, medical bills and debt consolidation. I would have to say that for the high interest rate, I would rather you only use it for debt consolidation or if you absolutely need the money. Taking out a high interest loan to pay for a wedding is only going to start your family off with debt it doesn’t need. I was actually surprised when I looked up the OppLoans review on the BBB website. Payday lenders have notoriously low BBB scores and even some peer-to-peer lending sites have scores of 4.0 or less. OppLoans has an impressive score of 4.79 out of five and an A+ rating. 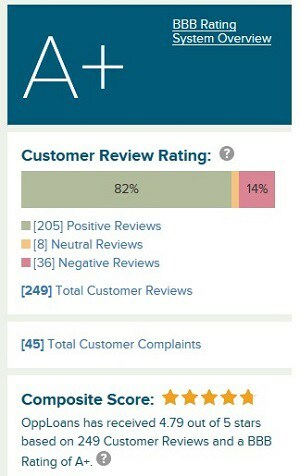 There are 205 positive reviews for the opportunity lender and only 36 negative reviews. The positive reviews revolve around the company’s fast loan approval and next-day funding. Borrowers appreciate the competitive rates and customer service is excellent. The negative reviews mostly revolve around state regulations that made it difficult to get a loan. This is usually from someone living in a state where only a credit line is offered or where OppLoans cannot extend loans. All the negative reviews of OppLoans included a response by the company or that the problem was being handled. After looking at the company and talking with borrowers, I can say that OppLoans is an excellent alternative to payday loans or cash advances for people with bad credit or no credit. Rates are higher the personal loans but you don’t need a credit score for approval. An opportunity loan is just that, an opportunity to get out from payday loans and get the money you need fast. OppLoans can fund your loan the next day and give you at six months or more to pay it off. 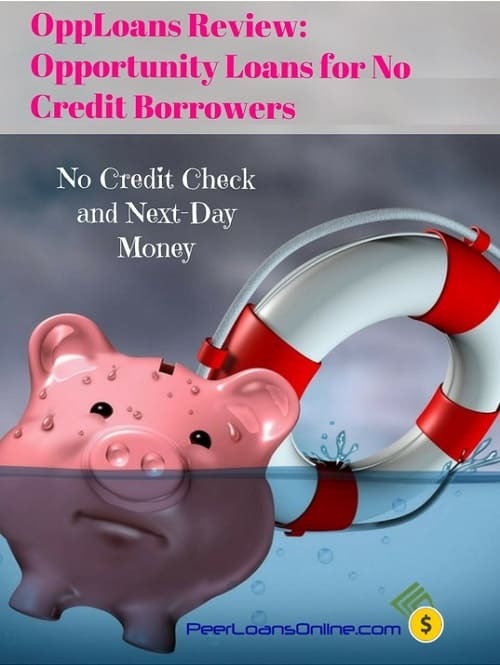 I would still check to see if you can get approved at a lower rate on one of the bad credit p2p sites but OppLoans is a great choice for people with bad credit or no credit at all.